For many Americans, St. Patrick’s Day is the day they break out that green leisure suit, claim that leprechauns are real, drink some artificially colored beer and eat a heaping portion of corned beef. While many of these so-called “Irish traditions” are actually more American than Irish, corned beef does have Irish roots. Here's the complicated Irish history of corned beef. Beef, corned or otherwise, wasn’t often eaten in ancient Ireland because the cow was considered a symbol of wealth in the Gaelic religion. While the Irish enjoyed dairy products (which didn’t require the slaughtering of the animal), beef was often reserved for royalty. The pig actually was the most eaten meat in Ireland. It wasn’t until England’s 16th century conquering of Ireland that the cow turned from an animal of deference to a food commodity. With a taste for beef thanks to the ancient Romans, the English brought in thousands of cattle from the Irish countryside to the tables of English urbanites (as the saying goes, to the victor goes the beef). But in the 1660s, a series of so-called “Cattle Acts” enacted by the English Parliament prohibited the export of cattle to England and kept Irish beef at home. This drove down cattle prices in Ireland and made the meat more abundant and affordable. While salting beef as a means of preserving it has been around for thousands of years, the term “corned beef” dates to around the time of the Cattle Acts. Originally the word “corn” came from the Germanic word “kurnam,” meaning “small seed.” In the 17th century, salted beef started taking on the name “corned beef” in some parts of England because of the large “kernels” of rock salt used to preserve the it. Though corned beef grew popularity in England, Ireland was actually the hub for corned beef production due to the abundance of cows and a lower salt tax, which was about one tenth of England’s. Due to these lower salt taxes, Irish companies were better able to import higher quality white salt, usually from Portugal or Spain. And because in good corned beef the quality of the salt is almost as important as the cut of the beef, the Irish developed a reputation for excellent products. The city of Cork, in southern Ireland, became the center of the corned beef trade through the 17th and beginning of the 18th centuries, shipping out half of the beef that the country produced. Irish corned beef became such a commodity that it dominated transatlantic trade, providing provisions for both sides of the Anglo-French War, to the West Indies and to New World cities like New York and Philadelphia. Unfortunately, as demand grew for Irish corned beef, the price spiked high enough that once again the very people who made it could not afford to eat it. They settled for pork and a new crop, the Irish potato. The Great Irish Potato Famine of the 1840s sent many Irish across the Atlantic to America looking for a better life. Settling in urban areas and making more money than their brethren back home, the Irish immigrants could more easily afford the corned beef in their adopted homeland. 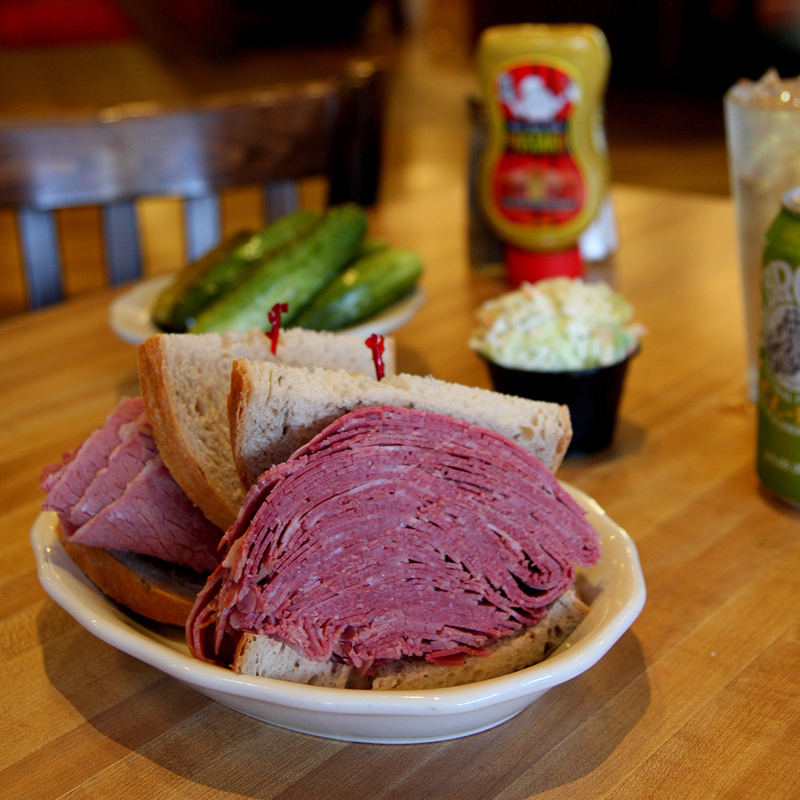 While categorized more as an urban myth, it is also said that the Irish began to love corned beef again thanks to their Jewish neighbors. At the turn of the century, the largest immigrant populations in New York were the Irish and the Eastern European Jewish people. Settling in the same overcrowded urban neighborhoods, the two populations formed a strong bond that encouraged the mixing of cultures. Due to the Jewish religion’s dietary restrictions, an influx of kosher butchers made its way into New York’s Irish/Jewish neighborhoods. So, the Irish often bought their meat from kosher butchers. Brisket was an overwhelming favorite at New York City kosher butcher shops. As Smithsonian Magazine points out, it is likely that kosher butchers used this particular cut of meat to make the corned beef that their Irish friends loved so much. So while corned beef may have Irish roots and be a favorite on St. Patrick’s Day here in America, back in the homeland, it really isn’t. They much prefer what their ancestors actually ate - good old fashioned Irish bacon.